The race is on Sunday 19th May 2019 at Worden Park. Find us on Facebook. The 10k race is open to ages 15 and over on race day and will be held under UK Athletics Rules. The fees for 2019 are shown below. In the event that the race is not oversubscribed entries will be permitted on the day. There will be an additional £3 charge for all entries on the day. 1 mile fun run open to all ages; children under 9 must be accompanied. Registration information will be released nearer the time of the next race. All competitors are required to collect their race numbers from the Race headquarters unless they have already received them. Race numbers may be collected from 9:00. The race headquarters will be located within the park. Parking is available at the main car park off Worden Lane. Please note, headphones will not be allowed. You need to be able to hear instructions from marshalls. 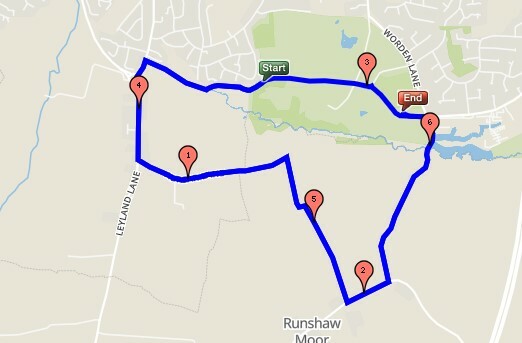 The race route is an accurately measured 10km, consisting of 2 laps that start and finish in Worden Park. The start line is approximately 10 minutes walk from the car park. All runners will receive a race memento. Prizes will be given to the 1st 3 men and 1st 3 ladies, along with the first finisher in all vet categories. One prize per person. These will be awarded in the race headquarters no sooner than 30 minutes after the race is finished. Other prizes may be awarded at the organisers discretion. This years race was held on Sunday 15th May 2016.